But rather than us sending you a quote that may or may not suit your budget, you can tell us what your monthly or one-off SEO budget is, and we will design services based on that. SEO services provided by us will be matched to your budget and resources. How can this possibly work you ask? Well of course there has to be an element of common sense and the understanding that, in simple terms, lower budgets will result in a lower SEO effort and slower results – it’ll be a slower burn. But not always, because at Webstrategies we understand that you may be able to some of the SEO work yourself, inhouse, keeping your SEO spend inline with your budget and resources. we work with you to get these activities done, using a combination of your efforts and our efforts at a level that suits your budget and resources. In addition to this, we don’t use contracts – you’re free to cancel whenever you wish. We’d rather you were happy and stayed with us because we provide value to your business. And the proof is in the pudding: we have a very low client-loss rate. Your website needs to be technically robust and fast to load. Your website needs, of course, to contain your important search terms and related keywords. The content needs to be linked together optimally and your content should be of a vary high quality and should engage your audience. Content should be updated regularly. Other quality websites need to link to yours. So link building is still important – but it has to be high quality. Social signals are an important trust signal, and this will become more important as time goes on. So, you really need to be involved with social media. It’s also very important to understand your competitors, and their online efforts. How else are you going to beat them. We can track alot of what they are doing and leverage that information. 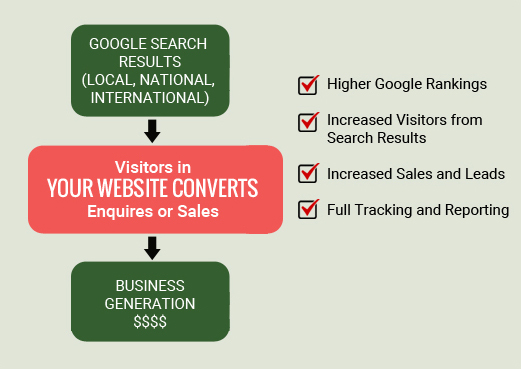 Local SEO, the use of video is currently a high growth area as well.